How much does eSurveysPro cost ? The pricing for eSurveysPro starts at $40.0 per month. eSurveysPro has 5 different plans such as - Premium at $40.0 per month, Corporate at $60.0 per month, Basic at $100.0 per year, Enterprise at $800.0 per year and Dedicated at $2400.0 per year. eSurveysPro also offers a Free Plan with limited features. For Further Details Please Contact the Organization. For the non-techy person, it does seem a little confusing at first because there is a lot you can do and the tabs don't always appear clear. 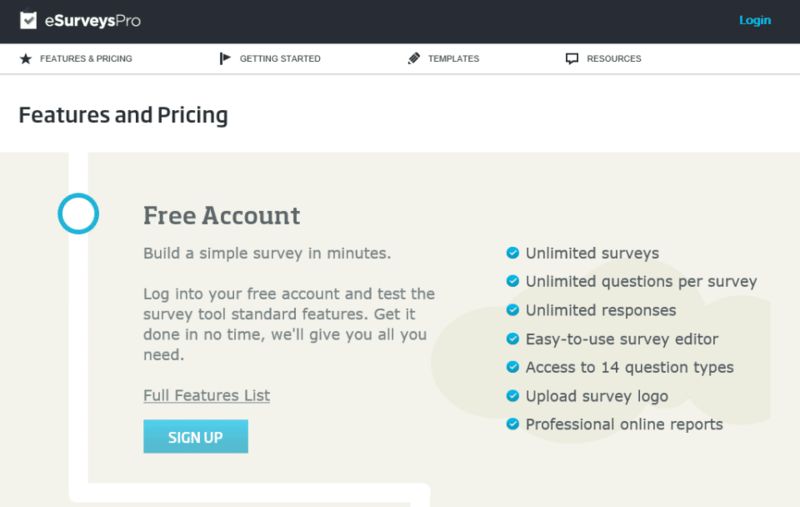 User interface is intuitive; it's very easy to create a survey. I can go from concept to live in less than an hour. 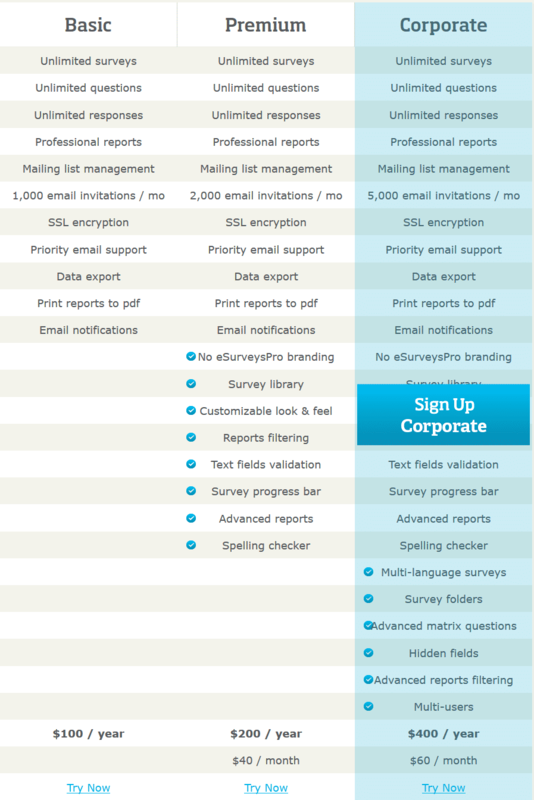 Limited features for free accounts; I'd love to be able to use conditional formatting or create a report showing free response answers all in one place, even if only on a trial basis. Very effective means of gathering information about employee knowledge and concerns regarding worker safety. I can easily reach out to my entire site, provide anonymity in responses for more honest feedback, and gauge how information is being disseminated, received, and retained. I am a student and am working on a research project. Hence, solving an issue about the consumer adoption of mobile wallets. I have come to realize that validation of my results requires me to do great amount of research with lots of quantitative analyses and interviews. Esurveyspro has aided me in that account and has proven to be a very effective software to use. 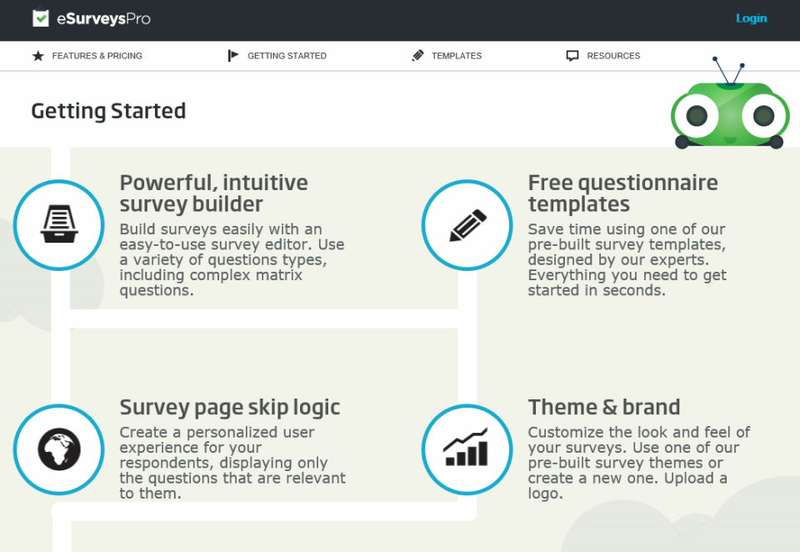 Comments: Pros: great tool for designing surveys and conducting quantitative analyses. Comments: Easy to use, very efficient and timely support. A positive experience from the start. Comments: Easy to use web interface. 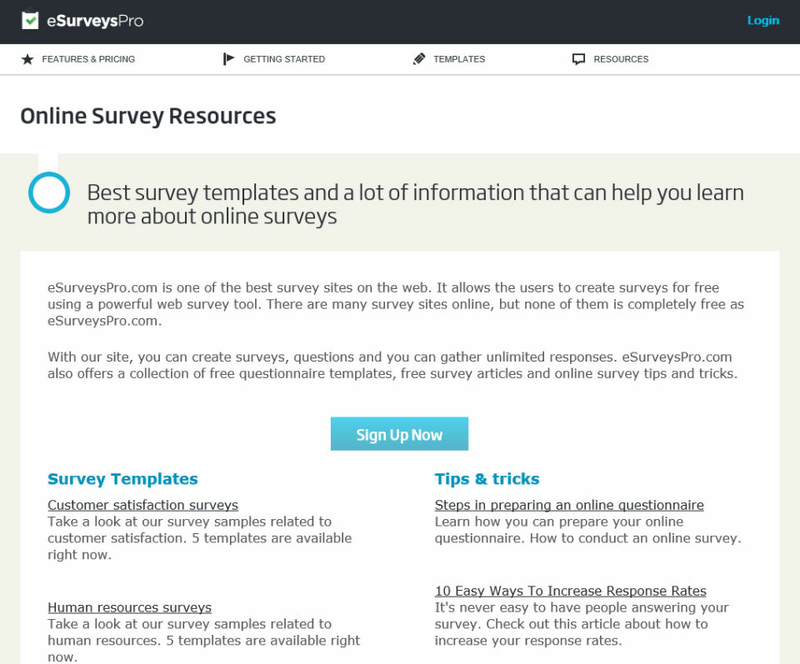 Nice looking surveys, including mobile devices. Comments: eSurveysPro.com is my new favorite survey tool. I have a Premium account and I am really happy with it. 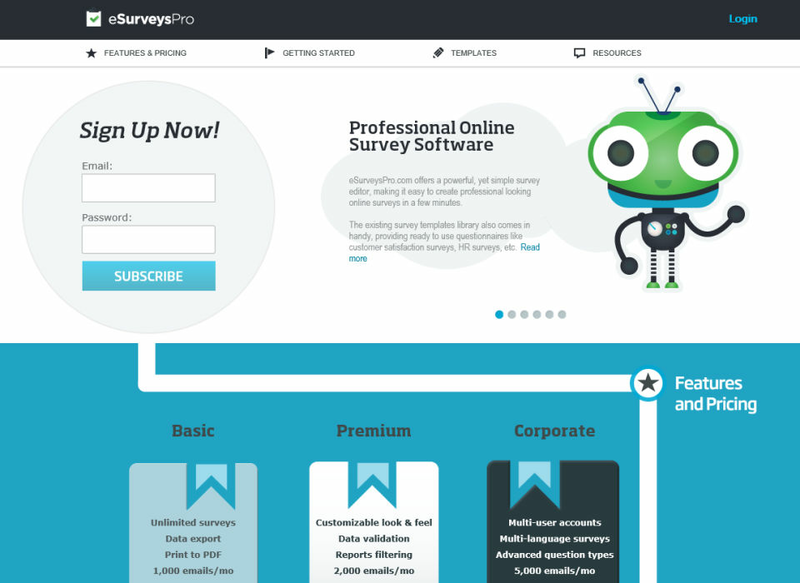 Comments: I was looking for a free survey tool and after trying more than 10 website, I have finally found eSurveysPro. The free account has amazing features. 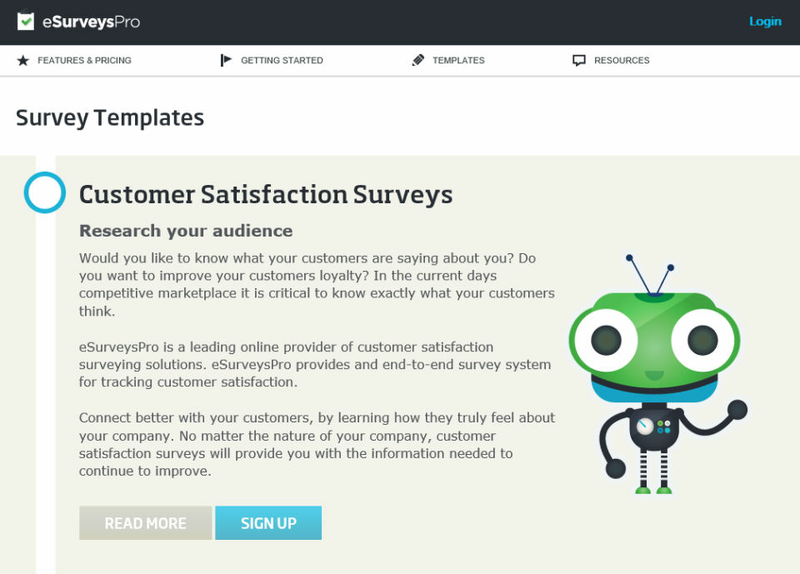 Comments: I have tried a lot of survey tools before deciding to go with eSurveysPro. And I did no mistake. eSurveysPro.com is amazing.